The Mag-Flip algae magnet is one of those products that makes you wonder “How did someone think to do that?” Â When we first saw the marketing for this product we weren’t convinced that anyone would want or need to have such a “novelty” algae magnet anyway. Upon seeing the Mag-Flip on the shelf we just had to give the thing a try. Low and behold not only does the Mag-Flip work, it works very well. The hard edged plastic blade worked very well on the curved edges of the Red Sea Max 130 in the video and it also handled the large bullnose of a Cardiff aquarium. To make the Mag-Flip do it’s thing, remove the magnet a few inches off the tank, do a 180 degree turn, and place it back down a few inches away from and parallel to the internal magnet. The only trick is that you have to do the 3 steps in one fluid motion but a few moments of practice and you’ll quickly be getting the hang of it. The Mag-Flip has a lot going for it besides the flipping.The narrow flat algae scrubber side of the internal magnet made it easy squeeze between tight spaces. The external magnet is smaller than the internal magnet so you can see what the scrubbing side and flat edge are scraping. The flat edge scraped away young coralline with just a couple passes. 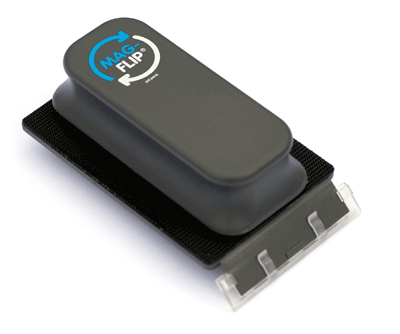 The Mag-Flip is thus far only available in one size for glass up to 3/8″ thick, retailing for about $40. Check out the demo video and prepare to be amazed.